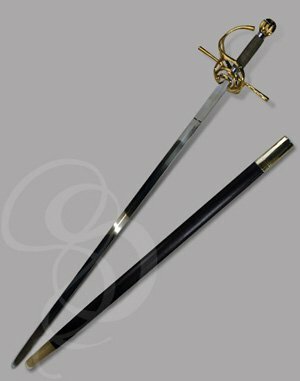 Truly a handsome rapier, this one, and wieldable by left-handed or right-handed warriors. Features a gorgeous set of sweeping guards that look great from the front or back. A completely unique, ornate fluted pommel. And a relatively light, high-carbon steel blade. If this were a women, I'd marry her. Or at least try to seduce her, then get a drink thrown in my face and have to hear about it for years from my so-called friends. 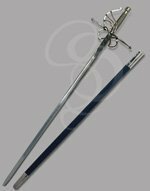 The Crossewind is everything that makes rapiers so popular. 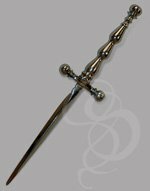 The swept hilt becomes more than just protection, but a statement about the person carrying it. The Crossewind is a beautiful weapon. The gaurds on one side sweep upwards and join together, to flow up and around the grip like a waterfall. On the other side, the guards form concentric half-circles that look like pond ripples or force lines. Jutting out to either side beneath the sweeps are two oversized Spanish-style crosses. These crosses grow slightly thicker as they get farther from the grip. The wooden grip is wrapped in braided wire and capped in nickeled rings. The brass fluted pommel implies royalty and worldliness and gives this rapier a truly unique feel. 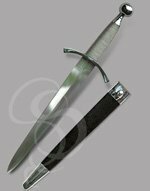 Heavy and durable sword, beautiful wooden grip. Got the blade engraved and it turned out great.